Bob and Robert Bevern. Photo: Robert Bevern. This could be the most excellent tale of 2019. But let’s hope not. I am hoping the year is full of other examples of good will, good luck, and good vibes beyond the story of this lost surfboard and how it was found. This tale takes in Sydney’s Northern Beaches, Dubbo, Bermagui, and the worldwide web weaved by social media. Robert Bevern now lives with his young family in Dubbo, but grew up surfing with his dad Bob on Sydney’s Northern Beaches. Bob was 63 when he died suddenly last August in a tragic surfing accident that Robert struggles to understand and explain. 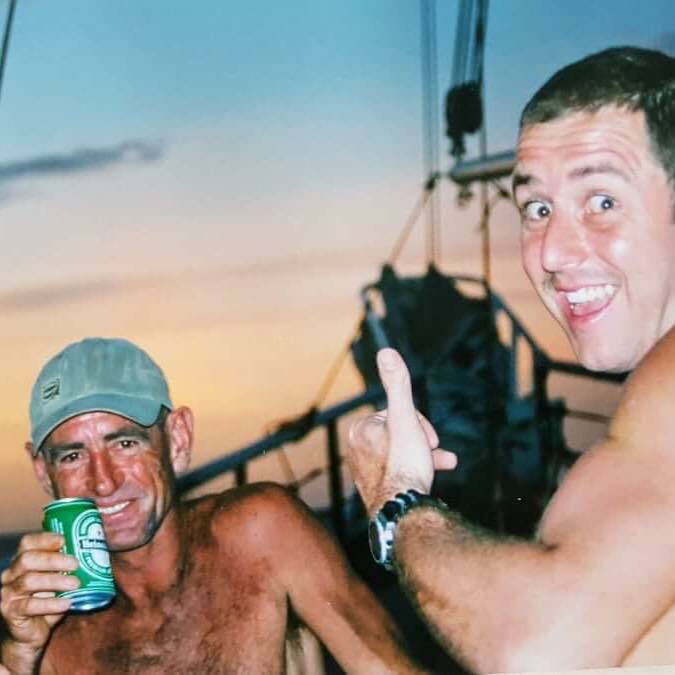 “He drowned at Little Avalon, from what they can work out and I still can’t believe it, his legrope got caught around a rock and he couldn’t get it off – he’s surfed for 25 to 30 years so it’s very hard to comprehend,” Robert says. Earlier this month via Facebook, Robert appealed for help from his social media friends and the Far South Coast to find a surfboard his father had made for him many years ago. The board in [this] picture was made for me by my dad a number of years ago and then somehow went missing years later. As you know, Dad died in August last year and I would do anything to get the board back. Well a family friend found it in Bermagui this weekend but the board was sold prior to him going back and getting it for me. All we know is that it was sold to a guy from Tathra on the NSW south coast. I am hoping that all of you who I’m friends with can help me out by sharing this post and hoping that it makes its way to the NSW south coast. To the gentleman that bought the board, I am willing to give you what you paid for the board so that I can have it back with my family. It would mean the world to me. Over the years, Bob built up a strong and unique surfboard making business under the name ‘Bitchin’. “He had some very far out designs, he used to bring back material and sarongs from Indonesia and put them under the fiberglass,” Robert says. 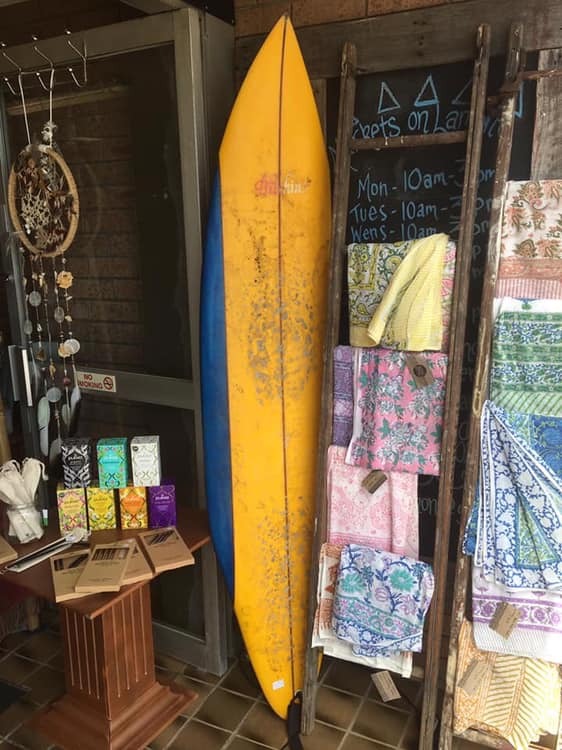 How this yellow and blue board come to be lost is a mystery, Robert thinks it was probably stolen from the back of his dad’s van around 15 years ago – never to be seen again, until family friends visited Bermagui and recognised the ‘Bitchin’ trademark on a board for sale in Markets on Lamont. The friends took a photo of the board in the shop and sent it the Beverns. “I saw the photo and said well I hope you bought it,” Robert says. Robert’s board as photographed in Markets on Lamont, Bermagui. Photo: Robert Bevern. Not realising the full significance, a photo of the board was all they left the shop with. “They went back to the shop on the Sunday morning to buy the board but it had been sold on the Saturday afternoon – the day the photo was taken,” Robert despairs. That’s when Robert made his Facebook plea, hoping the tangled networks of social media might lead him to the new owner. The post has been shared 587 times and liked 240 times, and features 301 comments of support and hopeful wishes. All that interest turned up a critical photo. On the Saturday when Robert’s board was sold, two other second-hand surfboards were also sold – three in total on the same day to three different people. That funny coincidence prompted Markets on Lamont to take a photo of the occasion and post it to Instagram. “Stacey at Markets on Lamont said it was just uncanny – they do sell surfboards from time to time but three in one afternoon!” Robert says. 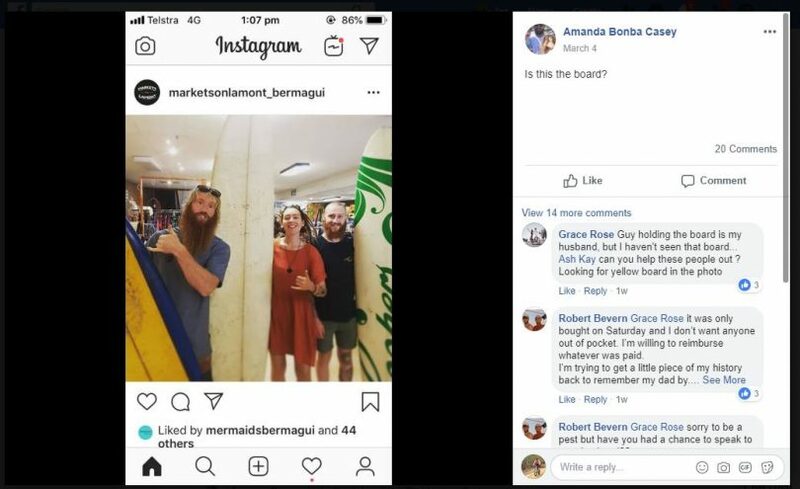 Tathra’s Ash Kay was identified as one of the three in the photo and the new owner of Robert’s yellow and blue Bitchin board. “And basically it went from there,” Robert says. Ash’s wife Grace Daley eventually got tangled in this whirlwind and made the connections. Bingo! The moment and the photo that made everything come together. Photo: Amanda Bonba Casey. “I don’t even use Facebook” Ash laughs. Ash has agreed to sell the board to Robert for the same price he bought it for. 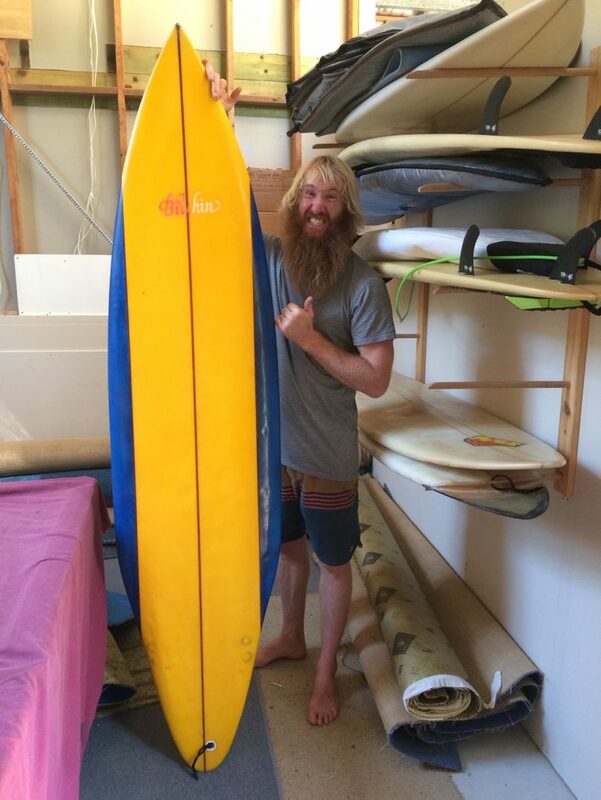 Robert is yet to get his hands on the board, the family friends who originally let it slip through their fingers are making a special trip to Tathra over Easter to collect it. “They feel terrible, but they have a new campervan and want to spend the week down there,” Robert says. Ash Kay with the Bitchin board. Photo: Grace Daley. Gerard Keith that the same one you stole a while back? classic Ash. The man. The legend.